Who doesn’t love a good barbecue? When the weather is nice outside, getting family and friends together for a nice and casual meal is fun. The most important person is usually the chef as he (or she) mans the grill. If he’s a regular griller he probably likes to have some new gadgets, ingredients, etc. to work with every now and then, so maybe gifting him something that will be appreciated during those barbecues is a good idea. We’re here to help you with ideas because there are some pretty nifty and useful items that are sure to please him. In fact, we also have a nice list of gift ideas for home cooks who just love to cook anything and everything. For gifts especially suited to male cooks, take a look at this list. But without further ado, here are our recommendations for gifts for BBQ lovers. A meat thermometer is a must if you want your steak or any other thick cut of meat done just right. However, waiting at the grill for the meat to reach the desired temperature or making sure it doesn’t go below a certain level is not ideal. Wouldn’t it be nice if there was a way to be alerted when this happens so that you could leave the meat to cook while you mingle with the guests or carry on with your other cooking? This long range wireless thermometer with a dual probe will let you do just that! Two probes can be inserted in two different parts of your cooking meat with the other ends plugged into the wireless transmitter that you program for your desired temperature range. The receiver can work up to 300 feet away and will alert you with a flashing light as well as with audible beeping when the temperature of the meat falls outside of this range. The backlit LCD screen will display the barbecue temperature up to 572°F although the heat probes can withstand temperatures of up to 716°F! The receiver unit can also be used as a countdown timer if you want to time your grilling instead of using the temperature probe. A gift basket is always welcome because there are so many treats in it and they’ll last at least a few days. There’s a gift basket for every kind of interest, any occasion and to suit anyone’s budget. 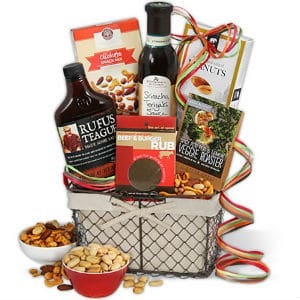 This particular basket called Barbecue Boss comes from GourmetGiftBaskets – a very popular company that ships goodies all around the country. It enhances a BBQ meal by providing hot, tangy, sweet and savory flavors in the form of two sauces, two rubs and two snacks sourced from quality gourmet food companies. You’ll be giving a spicy Peri Peri & lemon veggie spice blend, a beef and burger spice rub, a Sriracha Teriyaki dipping sauce, a hot barbecue marinade sauce, roasted and salted peanuts and a snack mix. All of this comes in a multifunctional lined wire basket. Grill brushes are a dime a dozen so you may wonder why this generic recommendation. Well, the difference with this grill cleaning brush is that it comes with a water chamber in the alloy aluminium handle that holds 2 cups of water that is released through a spout hidden amongst the stainless steel bristles. When you spray water on a grill that is still hot, steam forms instantly to soften burnt on food and grease, making it very easy to clean the grill grates. You can do it quickly and with very little effort. The grill head detaches and can be cleaned in a dishwasher. Most other grill brushes have a plastic handle and they need extra muscle to do a thorough cleaning job, so this gift is well worth the price tag. If the gift recipient already has everything he needs for a proper barbecue but pines for good weather for it half the year, consider giving him an indoor gadget that can at least impart that smokey flavor without actually grilling the food. A handheld PolyScience Smoking Gun can do that and more. It can even give that flavor to a soup or salsa! Check out our complete review here. Tenderizers are necessary for grilling meat, especially if the cut is not the softest. If the meat is not a thin slice, the marinade and sauces you use don’t get to the center, so a meat injector is useful too. Put both these tools together and you have this meat tenderizer that infuses the meat with the marinade at the same time. This handy tool saves time and effort before grilling and makes for a clever gift. The tenderizer uses 27 stainless steel blades that plunge into the meat and severs tough connective tissue. There are two depth settings so that even thick steaks and roasts are softened right through without making the cuts thinner, which is what happens with a mallet-style tenderizer. Among the blades are three needle-like marinade infusers that penetrate the meat and disperse flavors evenly. The marinade is held in a 3 oz plunger above. The tool parts lock into place for safety while in use and there’s a cover for the blade portion for storage. It disassembles easily too so that you can put all the parts in the dishwasher. Grill sets always make good gifts for barbecue lovers but a deluxe 14-piece one from Cuisinart is even better! All the tools in this set are made of durable stainless steel and they come in a light aluminium case with a handle so they can be transported easily. Every tool has a convenient hanging loop at the end of the 12 inch handle so that they can be hung at the grilling station within easy reach. The set includes a chef’s spatula with an inbuilt bottle opener and a cutting edge, a pair of grill tongs, a silicone basting brush, 4 pairs of corn holders, a cleaning brush, and a spare brush head. For small bites and delicate foods where a regular grill grate isn’t an ideal surface, this ceramic grill tray from Sur La Table is an excellent alternative. It’s light construction can withstand high heat and sits nicely on the grill while holding foods like vegetables, shrimp and sprigs of herbs. These foods won’t fall through the grate because the grill holes in the tray are small. Delicate fish won’t stick to the food-safe non-stick surface and it is easy to clean and maintain. The entire tray can go straight from the grill to the table to reduce clean up afterwards. To make it even easier, it can safely go into the dishwasher when you’re done. The gift recipient of this Fruit Keg Tapping Kit will have fun entertaining his guests with delicious drinks while serving up a grilled meal alongside! All that needs to be done is to create a level base by slicing off the bottom of a watermelon, melon or pumpkin, hollow out the insides for separate juicing, insert the shaft of the tapping kit low down in the side, and fill up the hollow with the extracted juice or a nice matching fruit juice, carbonated water, liquor or cocktail mix. The faucet can then be turned on and off to dispense drinks for everyone. When you’re done, just detach and hand wash.
Melted cheese is often an accompaniment on grilled foods. It’s great with toasted bread, burgers, grilled tomatoes, Bratwurst and even Quesadillas done on the grill. With this portable raclette, the grill master can have his favorite cheese melting right beside him while grilling any or all these foods. The base slides out and it holds three tea lights for heating the tray above that holds the cheese. Once the cheese has melted, the tray can be pulled out and with the help of the included mini spatula, you spoon the cheese over the grilled food. The cheese tray can also be placed directly over the grill if you don’t have tea lights on hand. This unique tool is made of durable stainless steel and white oak. This one is for the macho griller with a sense of humor! This is not just an apron with a few pockets; this is the camouflage print BigMouth Inc. Grill Sergeant apron that has a pocket for everything to do with grilling. The straps are adjustable and there are long and thin pockets for long handled grill tools, loops for the other tools like bottle openers, condiment bottle pockets, salt and pepper shaker holders, a spray bottle pocket and even fun elastic wraps for cans of beer! Caution: Beer cans fall out easily if the wearer bends over but that’s not really a negative if it generates more laughs with the audience. A true barbecue enthusiast is always on the look out for new ways and recipes for grilling. That’s why The Barbecue Lover’s Big Book of BBQ Sauces is one of the best gifts for grill lovers. It includes 225 recipes for sauces, marinades, bastes, rubs, pastes, chutneys and salsas, so the cook will always have something new to try. These include smoke-cooking recipes too. The authors are grilling experts from Bon Appetit magazine and the recipes come with detailed instructions on how to grill or smoke different types of food, including beef, bison, chicken, turkey, pork, lamb, goat, fish and seafood and even many game meats. The vivid photography adds to the mouth watering that this book induces. What is nice about these recipes is that they run the gamut from the great American BBQ capitals to international inspired flavors of grill-loving cultures around the world. ← What is the Best Deep Fryer for Home Use?